Hi blue flamers and Little Danny! Glad to be listening in real time today. Good day to you LD and Flamers. Danny,love this sad tremolo sound! man that's the perfect way of putting, and I'm with ya! Also, hi! And hi Zonk! Glad the time zone math puts you right here. Kind of a mellow bummer stroll. Ever see kids doing the Stroll in 50s TV dance show clips? It's cute/coolish, and only a half-degree away from a mellow bummer stroll. Hey, made it home (really nasty out there in NY/NJ). Could use a bit of flame around now. Chresti's brother gave me a tube amp that has a spring tank and a tremolo cut out switch. It lives on the front porch. For fun I jack in a Califone classroom record player and play surf records and such. Who the hell needs a Technics? this makes me think of 'Havana Moon"
I need a bar 'round here to adopt and bestow on patrons such a playlist as this. 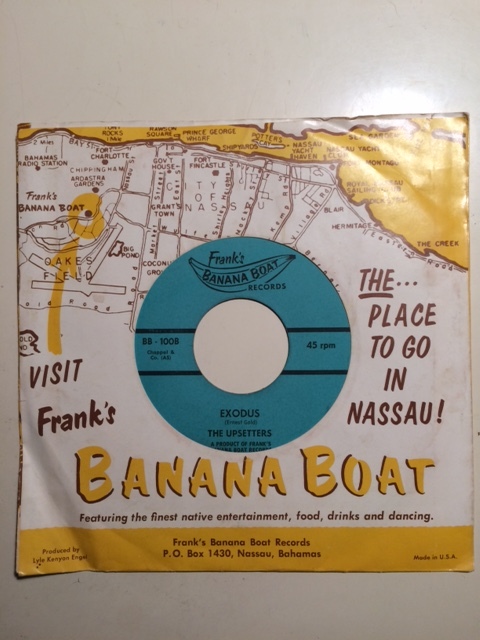 Did the Upsetters cover as well. Warning my tootsies with these cool sounds! Danny this set has being totally together! Melinda. Chresti. Thank you both. I'm glad! This stunnner and a revelation. Wow. Love this D.B. Shrier Quartet piece Danny. When it goes sparse it somewhat reminds me of The Necks. If you are not familiar with them they are worth tracking down, one of Australia's best exports. A man of good taste NGH. Have you had the privilege of seeing them live? Just about 3pm in Ozland. In EST o'er here in FLA.
@zonk: Yes! a few times in NYC. Different sound every time. (sort of like NL's "The Ex". Don't know either the Media or Shrier, did enjoy the Shrier track. @doctorjazz: yeah, Shrier Quartet was new to me too! ...The Necks, not the media, having my usual spell correct problems. I like the Upsetter's sleeve. The graphic style reminds me of the menus and place mats at a steakhouse chain from childhood. WV native represent! (yes, I was born there). melinda Your right it does! What a great sleep sound! A stripper looking out the window at another bleak day. @doctorjazz, a fine introduction to he Necks is an album called Aquatic, you won't be disappointed. What a grea alto sound he tried to say.. . I have many Caribbean "tourist" recs that kill. (and others that are tepid). OK, will stick my neck out and look for The Necks. Always dug Chico Hamilton, especially the version with Jim Hall. This is really nice. I love Chico's Impulse! work the best; his Pacific Jazz stuff gets a bit too California chamber-jazz for me at times, but there are plenty of highlights from his early catalog ala "Blue Sands"
I'm always up for vibes. I had this one Chico Hamilton record that had Lowell George playing slide guitar. Late night jazz grease. I gotta step out, but great show so far. Will definitely listen to the archive. godspeed Flash, and bon voyage! happy to have you here any time, Ignore F.
He was! Met him once in Venice. He was real nice. Never met him, but heard Little Feat with LG when they opened for (...am I remembering this correctly?...) ELO at Anaheim. Wish I'd been more attentive at the time. And one of the guys who engineered Waiting for Columbus has a stereo shop four blocks from my place. Therein hangs the original painting that was the album cover. Dean, What where?I love that painting by Neon Park! Sniff...sniff... I catch a whiff of ECM. One block south of San Pablo and Cedar (Kermit Lynch), east side, next to a bicycle shop. Warren Dewey. Check out his discography: https://www.discogs.com/artist/470110-Warren-Dewey He's a great guy. Between the time the painting was used for the cover and recent years NP made revisions, so claims Warren, but I've never compared the two. Will do! Chresti and I will be there in December. Marty(Neon's real name) was a native of Berkeley. Let me know! We'll go out for coffee/beer/LPs/books/what have you. Lowell George lived in Topanga, I think. Warren has fun stories about recording the album. And about recording Hendrix, one of his earliest jobs. Hey Geez! How was dinner? I've mostly missed another great show I see. Geez! Better any time than never. We're almost out of alcohol here, so drink up while ya can! i must depart early Danny Thank you! I also gotta sleep to rise for early auto appointment. Next Thursday, choosing what we are thankful for, i will be giving thanks for this particular show. Wait, I'll give thanks NOW! Thank you! I won't jump ship Danny. Checking out soon, thanks LD y amigos! Awesome show Danny, went way to quick. Until next week my friend. Danny, last call? Better bring me any open bottle and a straw! Pretty good, vacation in a week, can't wait! Drone core shoe gaze good night. Thanks,Danny! Look forward to reliving this from the top! Doc, wonderful! Where you goin'? Right after Thanksgiving, Vietnam and Thailand. WOW! Fascinating! Have a wonderful time and come back with stories! And records / concerts? If you go to Hanoi, check out the water puppet show. And buy a cassette! Should get there, sounds good!